The old man stood holding a basket of flowers that he hoped I would buy. The last thing on his mind was a fifty-four-year-old woman wanting to tromp through graveyards in her quest for a missing relative because she’d been bitten by the genealogy bug. My husband waited for traffic to subside and then pulled out onto the main road. “I don’t understand why you couldn’t find the address on the net. I told you that guy wouldn’t know.” My husband hates to stop and ask for directions. He turned up the road and eventually we found the Upper Bermudian church and cemetery; but, it wasn’t the right one. I was visibly disappointed. All those grave stones — and none of them called to me today. My husband turned the truck around and headed back the way we came. He knew I was unhappy. We’d been through a rough weekend with family members and a few outsiders, and this was our breakaway moment for an hour or two. To come back empty handed would surely put a damper on both our moods. “Let’s go left instead of right”, he said at the crossroads. We traveled about 800 yards on the new road when my husband chose to break for a farmer waiting to cross the route from his barn to a lovely farm house complete with a riot of bright flowers tumbling down both sides of the front walkway. “I bet he would know,” said my husband. I blinked. My husband? Ask for directions? While we’re moving? Not even when we are stopped and feuding over where we are going? Saints be praised and they’re not even from my religion, except at this point, I didn’t think asking the farmer would do any good. My husband drifted the truck over to the barn as the farmer watched him with interest. A hidden cow uttered a long, musical greeting. “What can I do for you folks?” asked the farmer, skin already sunburned from this season’s work, as he walked toward the driver’s side of the truck. My husband explained what we were looking for with the minimal information that we had. They jawed for awhile, two men trying to figure out a timeless problem — directions. They finally determined that neither one of them knew where the hell this cemetery was located. I could have told them that. “Oh, you don’t have to bother her,” I said, finally entering the conversation. I felt we’d already taken up enough of his time. “No. No. That’s okay. We’ll ask her,” he said, already crossing the road and heading toward the house. I handed my husband the paper with the information I’d collected. He cut the engine and scrambled out of the truck. I watched him trailed after the farmer. The wife appeared on the porch, a pleasant, well-coiffed woman, and shook her head. She went back inside. The men continued to talk. I could see they’d already bonded and if I didn’t get out of the truck we’d be setting down for iced tea before long. Truck keys in hand, I crossed the road and walked up the brick steps. A gray cat appeared out of no where and circled my legs, talking to me as if we were best buddies. I reached down and scratched his head. When I stood up the wife was back out on the porch with a portable phone in her hand. And a discussion ensued between the men on the placement of said road, my husband smiling and nodding with great gusto. “I know right where that is!” was the outcome. They asked us to sit and stay awhile, but the afternoon was drawing to a close and responsibilities awaited me back at my own home. If we didn’t find the cemetery in the next forty minutes or so, we’d have to go back with an empty camera. After we thanked them and headed toward the truck I could hear the farmer ask his wife if she was ready to go out to dinner. “Not quite yet,” she said, which made me feel better that we hadn’t kept her too long from their plans. Twenty minutes later we pulled into Mt. 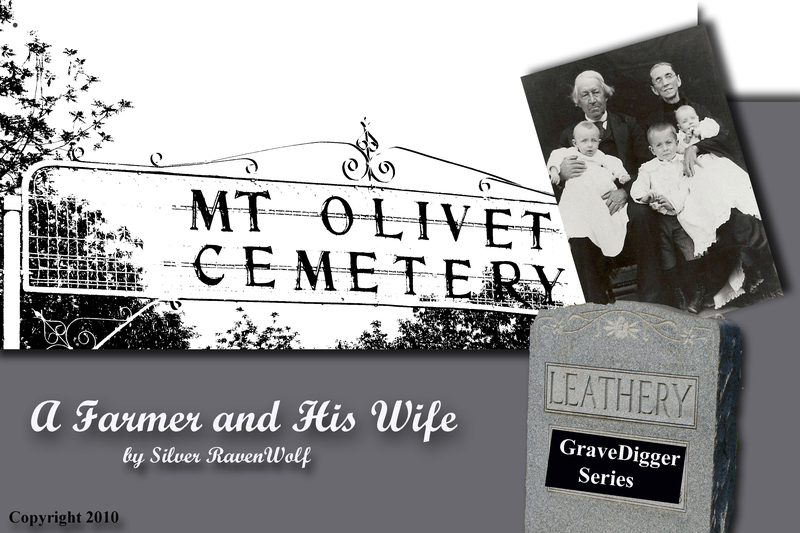 Olivet Cemetery, and after another twenty more, found some of the graves I’d hoped to discover and some that I was surprised to find. Because time now presented an issue my husband took one end of the graveyard and I strolled the other. We couldn’t stay long so I snapped as many pictures as I could. I would probably have to return; but, at least I now knew where to go. Mission accomplished! My success, however, isn’t the reason I’m telling you this story. In my real life as a Witch, I meet a lot of so-called spiritual people that have grand plans of doing good things. Sometimes we eagerly ride along with them, thinking their end vision is the same as ours. We are utterly disappointed and totally taken aback when the black hat comes off and the common evil of greed, hate, jealously, or anger emerges. On occasion this is a friend, too often it can be someone closer. If you are faced with such a circumstance, think of the farmer and his wife. A moment time. A willingness to help without payment. And a smile for the road. This past Mercury Retrograde certainly kept me busy! From working on my genealogy files, to updating my Twitter account, organizing my small office space, and much more. Although the weather was less than delightful here, I was able to finish several open projects and prepare for great new ones! My new WordPress Blog is the first project launch after the retrograde cycle. My website has been completely rebuilt and we are only waiting for appropriate paperwork to come through to finish the launch. I’ve attached my Twitter to my FaceBook; this way I can update both at the same time. When the new website opens you’ll find that it, too, will be connected to both Twitter and FaceBook. I also spent a lot of time these past few weeks reconnecting with old friends and continuing to work with new ones! From the Amani Festival to several meetings at my house, we’ve been cooking up tons of magick. I also wrote the basic format for the Pow-Wow healing circle that we do, and will be sharing the chants and charms with you through this blog. That way, you can use the same material when you work along with us every other Thursday Night. I’ve had several folks ask me about Pow-Wow training. I’m continuing to work on the lessons, have started a few students (although they have had to patiently wait) and I will get back to those of you who have shown a genuine interest. The name of the organization is The Divine Order of the Black Star — Braucherei and PowWow, and will consist of those already skilled or wishing to learn the art and science of the Pow-Wow system. The artwork in this post also represents some of my projects over the retrograde period. I visited graveyards, took in my first flea market of the season, created a To Do Project Journal, and worked magick with a lot of old skeleton keys to open the way for future endeavors. When I found the old photo at the flea market I just had to have it. 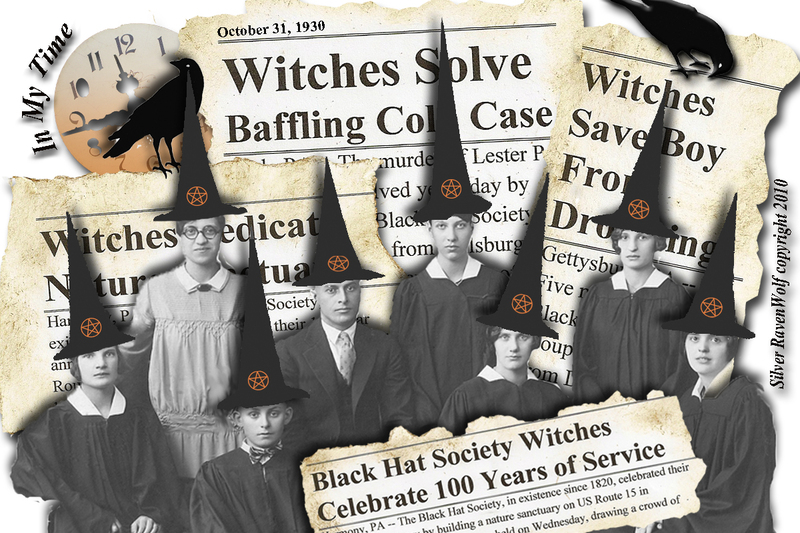 It would be nice to live in a world where Witches were congratulated for the work that they do — from healing, to charity, to investigations — without the stigma of being strange. I wanted to show, in art form, that we are more commonplace than the general public believes. I hope that you enjoy the new blog format, and keep coming back to visit!